Midsummer is here! The year has gone by so fast it’s unreal! commitments we were only in Russia for the 34 hours for the concert, but we had a nice view of the city in the taxi ride home after the concert! 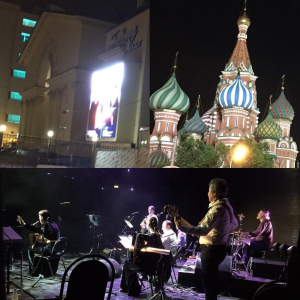 It was an amazing experience and loved playing in the Russian band too playing Ingush music. Maybe it’ll happen again some day! Since then our feet have barely touched the ground! We were picked up from the airport by John so we could do more recording for Purcell’s Polyphonic Party, from there straight to Chester Folk Festival, Maghull Folk Club, Red Lion Folk Club (to support and see our friends Cloudstreet), Rhyl Folk Club then up to Cumbria to rehearse as seriouskitchen. 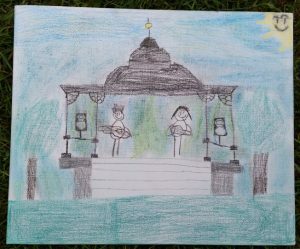 We’re hoping to have the PPP album ready for Sidmouth – but we think that we’ll be doing pre-orders there. Sometimes you can’t rush these things – but we are in the mixing stage now! Hope to see you at one of these places. I’ll leave you with a little youtube video celebrating midsummer – playing nyckelharpa outside in the garden! May already?? The time has just flown by! We’ve got a few weeks at home at the moment, but we’re working our little socks off! Still recording the Purcell’s Polyphonic Party album. Jonny has been working incredibly hard on this! We’re playing for the Saturday night dance at Chester Folk Festival, so we finished putting a dance tune list together and are all ready to go for that. We’ve had an unexpected gig come in. 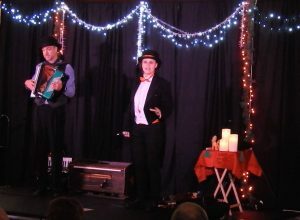 It’s not your normal Vicki Swan & Jonny Dyer gig, but we’re both involved. We’re off to a secret location for a secret gig. Well it’s not really secret, but it’s certainly going to be an adventure! We’re off to Russia to play as part of Daria Kulesh’s Long Lost Home Band. The Gradsky Hall in Moscow. It’s been a frantic couple of weeks sorting out visas and travel and writing new parts for different instruments! More anon! As usual time has got away from us and I’ve not blogged in a couple of months! We’ve got a couple of gigs coming up at the end of the month, this will be here before you know it! We’ve been busy recording the new Purcell’s Polyphonic Album, it always takes longer than you think! 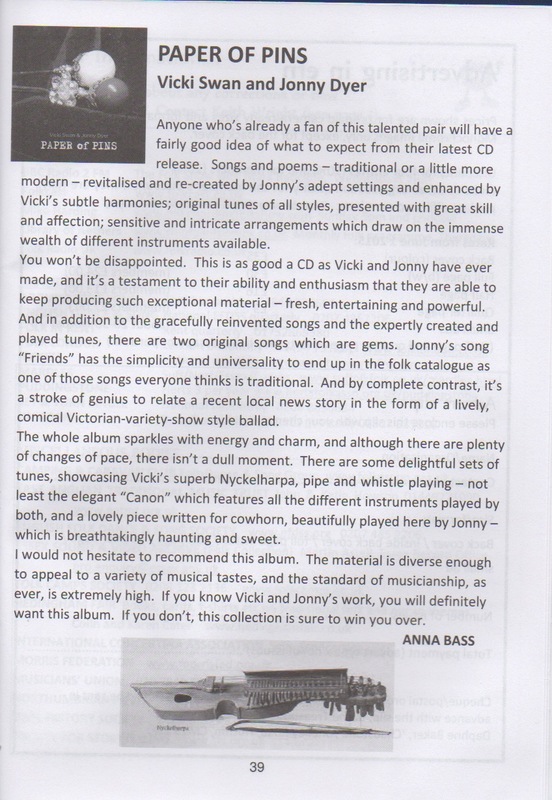 We’ve had another review through for Paper of Pins, from EDS. Click on the picture on the left to read it! Next month we have more Wind in the Willows rehearsals and then we start to hit festival season! We’re already into February and getting through that at an alarming rate! We’re off to the Cellar Upstairs in London on Saturday and Smörgåsballad in Abbots Langley on Sunday. Then we are on the slippery slope of heading back to Halsway Manor on the 10th March. In-between then we’ve got gigs, rehearsals for Wind in the Willows, a launch concert to prepare for with Daria Kulesh at Cecil Sharp House and more Smörgåsballads. In all the spare time we’ve finally started recording the Purcell’s Polyphonic Party album. You’ll have to watch this space for news of that when it arrives. At the moment Jonny is beavering away researching up speeds and numbers of times each tune needs to be played to make sure that not only is it fun to listen to, that it’s danceable too! It’s finally out in the open! 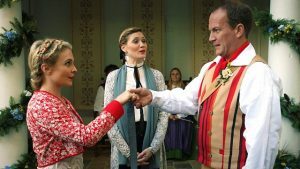 Our secret mission back in October was to be Swedish musicians for Holby City! We sat and watched the episode last night and in-between the guts and gore we had a lot of fun spotting us and our dancer friends. All four of our scenes were kept and all music we recorded was used. 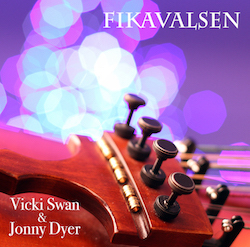 We were very happy that Fikavalsen was kept in, especially as we’ve released it as a single! The episode will be up on BBC iPlayer for the next month, so it’s not too late to watch us! We’re also the sound track to the behind the scenes video. You get to see a bit more of what we experienced that day. 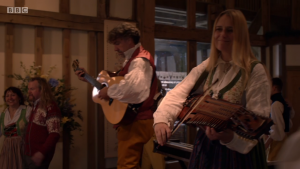 We’re very happy to say that the nyckelharpa is now well and truly introduced to the mainstream BBC1 TV audience. Buy the single from our website! It was a really fun week, especially fun as we do this for weddings anyway, just not quite so dramatically! 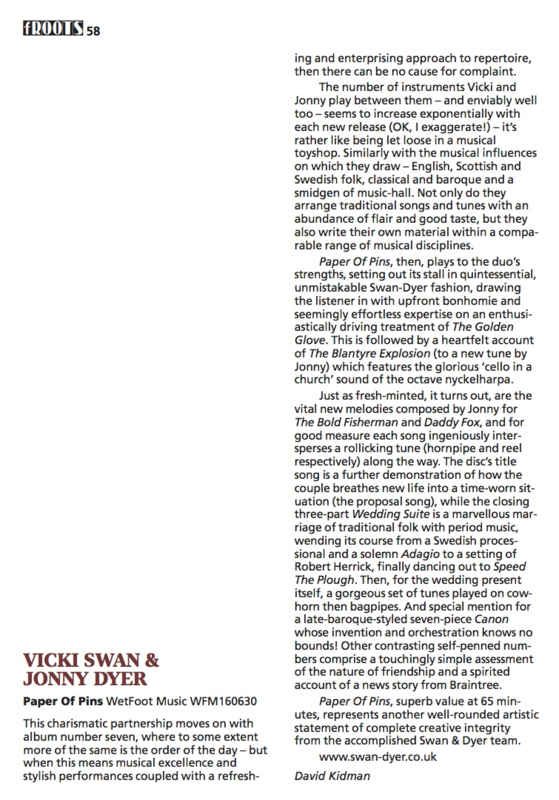 Available from all good digital download stores. In Swedish ‘fika’ is to have a cup of strong coffee with a cinnamon (or any kind of) bun. As often as possible. It is a Swedish institution to stop for fika. Swedes drink really strong coffee. This waltz was written to be calming when you’ve had too much caffeine. Winter Tour News and more! 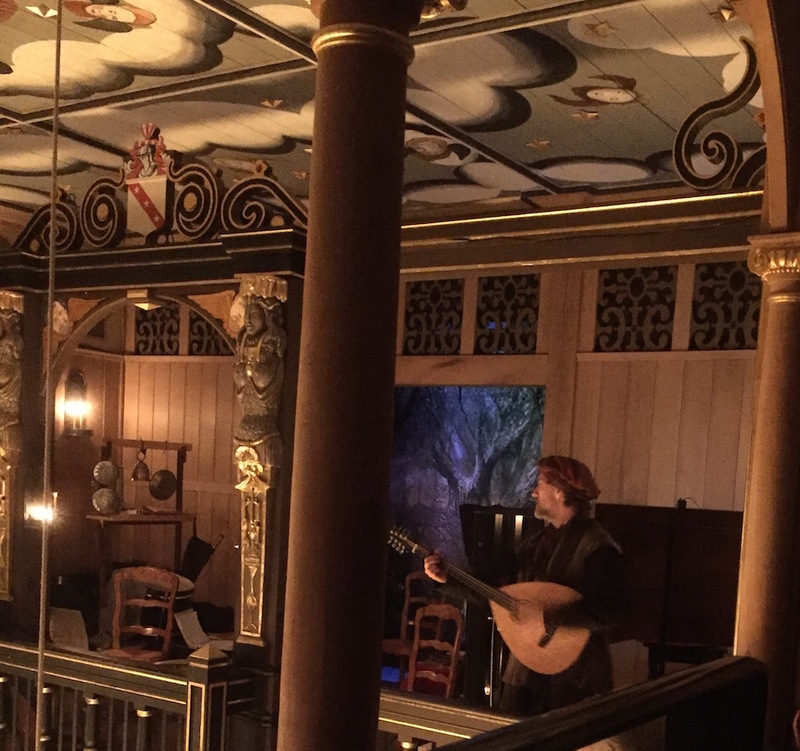 It’s been a frantic autumn with Jonny performing at the Sam Wanamaker Playhouse in London. Thankfully the beard has now gone! 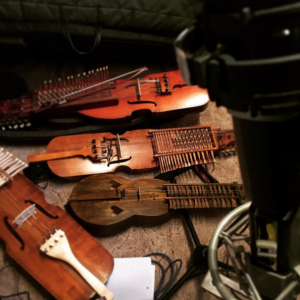 Vicki has been working hard on the concept of her new nyckelharpa show (the details of which are being kept a closely guarded secret, but you can see some of the preparatory work in the youtube playlist below. (Sometimes drastic actions are required to improve your playing). 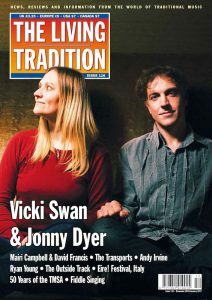 We are delighted to have been interview for the 116 edition of The Living Tradition Magazine over the summer and amazed and very pleased that we made the front cover! You can read the interview on the website! So hope to see you somewhere on the road this December – we’re covering enough miles to hopefully be able to catch everyone! We had the most amazing summer! Things are calming down now, but we’re off to The Netherlands for the weekend next weekend. SO if you’re in the Hague region – come and see us!!! We love catching the ferry to go to gigs, so it’s a lovely adventure. We’ll make sure we take lots of CDs and books with us. Come and say hello!